Visitors from across the world come to watch as up to 8,400 gal of boiling water shoot an average of 140 ft into the sky roughly every 60 to 110 minutes from one of the nation’s most iconic landmarks: Old Faithful. With more geysers than anywhere else on Earth, more than 4.1 million people visited Yellowstone National Park in 2017 to marvel at the park’s unique water features, according to the National Park Service. However, more visitors inevitably leads to more roads and walkways throughout the delicate ecosystem and fewer permeable surfaces for storm water to infiltrate. Additionally, concrete and asphalt pathways quickly fracture and erode in the freeze-thaw conditions of the park, threatening the careful microbial balance of the geyser basins and hot springs. Yellowstone National Park, Michelin North America, K.B. Ind. (KBI) and nonprofit Yellowstone Forever have worked together to find a more sustainable solution to provide park visitors with safe walkways that protect the ecosystem while also preventing thousands of tires from entering the waste stream. Michelin donated tires that have been repurposed into a permeable pavement, developed by KBI, to withstand the region’s harsh weather conditions and filter storm water, all while providing an ergonomic and durable walkway. Volunteers from Michelin North America collaborated with Yellowstone National Park, Yellowstone Forever and KBI to lay the pavement. A partnership started more than 10 years ago when Michelin gave the park technical guidance on tire maintenance and then began providing in-kind donations of $125,000 worth in tires annually for the park’s nearly 700-vehicle fleet. As the relationship between the park, Yellowstone Forever and Michelin grew, the partners sought new ways to increase their collaboration and find more sustainable ways to use the tire donations. All parties involved wanted to find a solution that would make the tire donations “not cradle to grave, but cradle to cradle,” Augustin said. Michelin, whose North America offices are based in South Carolina, also wanted a way to increase awareness among its own employees regarding the value of the Yellowstone partnership happening across the country. At the same time, Michelin was beginning to develop a relationship with KBI, the manufacturer of Flexi-Pave. Flexi-Pave is developed out of rubber granules and stone, held together by a polymer binding agent. To create the material, one tire covers approximately 3 sq ft. The material’s design can absorb up to 4,000 cu in. of water per hour, allowing storm water and snow melt to percolate through the material. As one of the most visited areas of Yellowstone National Park and one of the most active thermal areas in which the aquifer and groundwater are an integral part of the landscape, the Old Faithful Geyser Basin was selected in 2014 as the initial site to begin replacing walkways with the permeable paving material using recycled tires donated by Michelin. However, Bagnall stressed that the material is not designed to be in competition with asphalt or concrete. Rather, it is to be used where asphalt or concrete cannot perform. The material allows water to sink into an aquifer at more than 3,000 gal per sq ft per hour and treats the water as it passes through. The material’s pore space, which has 23% emptiness in the dynamic voids within the matrix of the material, naturally grows an anaerobic bacteria, which removes approximately 86% of dissolved nitrates and dissolved orthophosphorus. The completed pathway filters storm water while providing an ergonomic and durable walkway. Collaboration was essential to make a project of this magnitude a reality. Yellowstone Forever acted as the conduit for Michelin and KBI to work with the park, Augustin said. Michelin Corporate Foundation, headquartered in France, provided the funding. Employees from Michelin, the National Park Service and KBI all came together to install the permeable pavement. Michelin wanted to strengthen its employee connection with the Yellowstone partnership. For the first phase of installation in 2015, Michelin ran a random employee drawing and selected 10 employees to win a trip to Yellowstone National Park and help install the pavement. The company received overwhelmingly positive feedback on the program and continued a similar drawing for subsequent phases. Many of the employees had never been to the park before, Owens said. The program brought together employees from across the county to collaborate on the project and connect with Michelin’s tire recycling initiative. “It also makes them even more proud to work for a company that would invest in them having this experience, invest in a partnership with the park, and then learn more about the material and the product and see tires be recycled into a good use,” Owens said. The installation process involves mixing recycled tire chips with a binding material before smoothing the mixture onto the pathway with a board, similar to concrete installation. The mixture needs to cure overnight before it can be walked on, but Owens recalled an occasion when a bison walked across the pathway as the crews were still working on it. The material’s pore space naturally grows an anaerobic bacteria, which removes approximately 86% of dissolved nitrates and dissolved orthophosphorus. 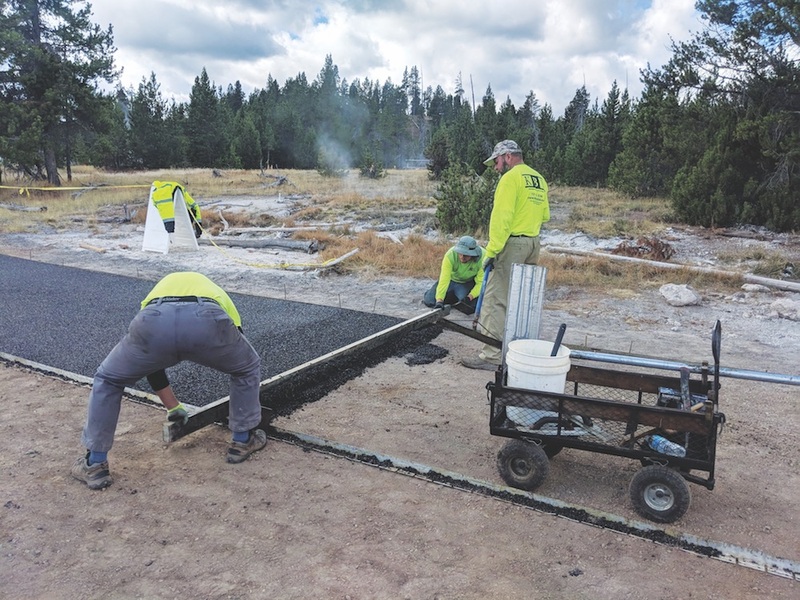 So far, four phases of pavement installation have been completed, beginning in 2015 and continuing annually at different locations throughout the Old Faithful Geyser Basin. The first covered 6,490 sq ft, the second covered 4,610 sq ft, the third covered 8,000 sq ft and the fourth covered 14,000 sq ft, Augustin said. So far, the permeable pavement material has performed well in the challenging ecosystem and received biannual maintenance. Despite the challenges, all parties involved seem optimistic about the future of the project and potential future phases. Michelin North America has submitted a proposal to Michelin Corporate Foundation for funding to complete an additional phase of the project, though this time the pavement would be located in the park’s second most popular area near the Grand Canyon of Yellowstone. Moving forward, Bagnall sees potential for permeable pavement like he creates at KBI to become more prominent as urbanization increases. Augustin agreed that the Yellowstone project could serve as a case study for other applications. “I think that these public-private partnerships are essential in maintaining Yellowstone’s ecosystem and protecting and preserving it for the future,” Augustin said. When Owens visited Yellowstone National Park in September 2018 to install the most recent phase of pavement, she took the opportunity to visit previously laid sections of the project. Her view of the storm water-friendly material inspires hope for future phases of the project and perhaps a more widespread use of permeable pavement in the future. Four phases of pavement installation have been completed, beginning in 2015.